My mother, Marie Hablitzel, was a second grade school teacher. Her students remember starting each school day with a drawing lesson. After she retired, we coauthored the Draw Write Now series. Marie Hablitzel started each school day with a drawing and writing lesson. Marie taught primary grades at Gerber Elementary in California for most of her career which began in 1942. She and my father raised six children. Their daughter, Julie, teaches at the school where Marie taught. Bob, their son shown here, also became a teacher. 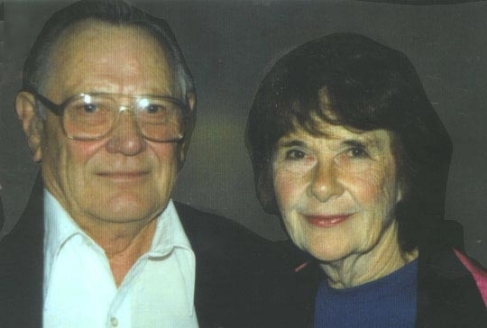 After retirement in 1982, she volunteered at Community Christian School in Red Bluff, California and gave a lesson each week over the next twelve years. My children are the youngest of her grandchildren. We lived a long distance from Marie, so in 1991 she mailed drawings and notes to my five year-old daughter so she could do the lessons like the older grandkids. A family friend, Carolyn Hurst, worked in publishing. 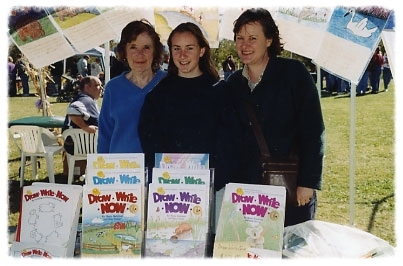 In 1994, her company, Barker Creek, released the first Draw Write Now book. Marie and I promoted the books at conferences and conventions. This one was especially fun—the Dairyville Orchard Festival—an annual festival in Marie’s community. Maryanne, Marie’s granddaughter and my niece, helped us. Marie enjoyed three-mile walks up until a few weeks before her death in 2007 at the age of 86. I was blessed to have the opportunity to work with her and am honored to continue her work.